Hardcover, 120 pages, 20.5 x 23.8 cm, 8.1 x 9.4 in. 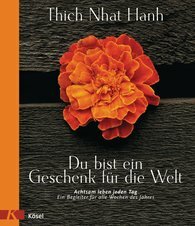 Thich Nhat Hanh, one of today’s greatest spiritual teachers, is famous for his warmth, his poetic language and his application of Buddhist teaching to everyday life. In this book, the gentle Zen master accompanies the reader like a wise friend, providing a short, inspirational text for every week of the year. His words act on us like a loving touch, opening us to the miracle of life and giving us both serenity and energy. Atmospheric double-sided photographs translate Thich Nhat Hanh’s messages into images that touch the soul. This attractive volume is a perfect gift for anyone who loves beautiful books and wishes for incentives to live a conscious life.